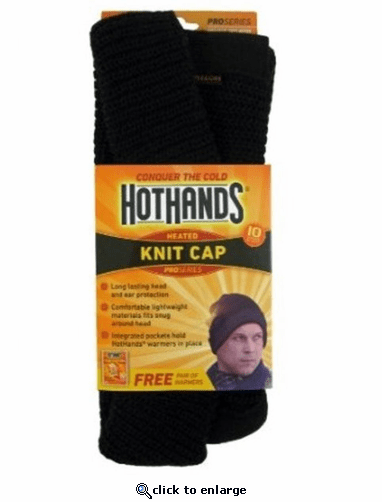 HotHands heated caps are perfect for anyone wanting safe, convenient, concentrated warmth in cold weather conditions. Caps come with one free pair of HotHands warmers. Specially sewn pockets keep warmers in place providing long lasting heat! HotHands Heated Apparel help keep the body warm and comfortable in the outdoors when the temperature drops! Specifically made with special pockets to fit HotHands warmers, this outdoor apparel is designed for comfort and providing long lasting heat. Choose from caps, mittens, socks, balaclavas, gaiters and more. When to use HotHands Heated Apparel? Designed specifically for use with HotHands warmers. How do Hothands warmers work? Hothands contain ingredients like iron, activated carbon and water. Once these ingredients come into contact with the oxygen in the air, the ingredients oxidize and produce heat. The combination of ingredients has been specially formulated to ensure a constant and comforting heat for a wide variety of uses.